Land pollution is the pollution of the Earth's natural land surface by industrial commercial, domestic and agricultural activities. 1. Increase in urbanization :- Construction uses up forestland. This leads to the exploitation and destruction of forests causing imbalance to climate. There is more demand for water, hence reservoirs are built causing the loss of land. 2. Increase in agricultural land :- As the human population grew there was a greater demand for food, thus more land allocated to agriculture. 3. Overuse of pesticides and chemical fertilizers :- Chemical herbicides and pesticides kill bees and other pollinators. Chemical fertilizers do not put minerals into the soil. Consequently, the crops grown have very few minerals and causes non-biodegradable chemicals to enter and accumulate in the food chain. Vegetation alone has the unique ability to convert inorganic minerals absorbed from the soil and water into organic forms that animals and humans can use. Because humans are at the top of the food chain, we are suffering the most. Chemical fertilizers, herbicides and pesticides contaminate the air and water. Top soil is not held in place, and it blows away. 4. Deforestation :- Felling of trees to clear land for agriculture, as well as processes like desertification and land conversion. Desertification is when human development and/or other actions, converts a piece of fertile land into desert-land or a dryland. Land once converted to a desert-land can never be reclaimed by any amount of corrective measures. This is also a serious issue because it does not only affect land, but also the overall biodiversity of a place, especially when land is cleared for agriculture. A lot of indigenous flora and fauna is lost in the process. 5. Industrial activities :- In open cast mining, huge holes are dug in the ground and dangerous deep mining pools are formed. What are left behind are heaps of mining waste and these waste often contain poisonous substances that will contaminate the soil. 6. Inadequate waste treatment :- A large amount of waste collected from homes, offices and industries are neither burnt nor recycled but is left in certain areas marked as dumping grounds. We throw away more things today and there is an increase in the quantity of solid waste. This has given rise to problems as new dumping grounds have to be found. 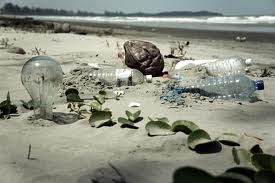 The amount of litter produced can be remarkably reduced if we avoid the use of plastic. Other key causes of land pollution include - nuclear research, chemicals released by all sorts of heavy industries, coal-fired power plants, and metal-producing industries, to name a few. Many of these are unavoidable, however, the severity of these actions in terms of the effects they have on the land, can be reduced by taking appropriate and corrective measures.